Feel free to choose more than one! We will do our best to place you in the role you would most like to be in, but we cannot guarantee this. Let us know if there is any work that you are unable to do. You are able to donate in multiple ways: A cheque mailed to our mailing address, donating at events, or by using either of two options to donate online though PayPal or CanadaHelps.org. Links to donate are shown on the right side of this page. You can also send an e-transfer to our email address (highwaytohealing@live.ca) through your online banking page. You will be provided with a tax receipt for your charitable donation. As Highway to Healing has now expanded our policies to include the ability to offer assistance to families in Osoyoos and Ok Falls, there is a need for volunteers to keep an eye out in Osoyoos and Ok Falls for where our help may be needed. If you are active within either of these communities or otherwise think you would make a great advisor to our Board, please contact us. H2H sells branded GoVino unbreakable wine glasses, and T-shirts with our logo on it. Wine glasses can be ordered in any quantity, and T-shirts are available to order in children and adult sizes. 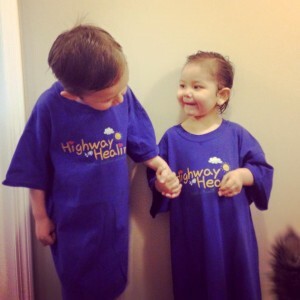 If you would like to purchase H2H merchandise, please contact us. Gus and Lynnea Holmstrom showing how great they look in our shirts. Keep an eye out for H2H’s next event, and you could volunteer your time. You can stay updated with H2H by providing your email address, by following our twitter account (link at the top right), liking our Facebook page (link at the top right), checking back here often, or contacting us. By following and liking our Twitter account, Facebook page, and RSVP’ing to our Facebook events for our fundraisers, you are helping us increase our online presence and awareness. The more people that are aware of us and what we do, the more people we can help! Here is a link to our Facebook page, and here is a link to our Twitter account.